I can truly say I've fallen in love with #bangalore. Beautiful city, beautiful people. I could stay forever. Once again the morning greeted us with the Indian sun playing shadows on the walls. A playful and friendly reminder of how perfect mornings are here. It's warm and gentle, kissing you on the forehead to wake-up, reminding you to move before its full might comes bearing down on you in the mid-afternoon. We replayed our breakfast routine with lighter portions that morning. Hydration was key, as was my caffeine from my cappuccino that I was now capitulated into requesting from our staff rather than making it myself. We had adjusted well and felt no level of jet-lag or sleep deprivation. By mid-morning we headed off to Commercial street to meet up with Aditi once again. Commercial street is a hodgepodge of eclectic shops, tourists and manufactured goods along side of handmade sarees and fabrics. It's a great place to find cheap tourist gifts, though you might find the repetitiveness of manufactured goods cheapens the authenticity of any expectations you have for more traditional purchases. Such was the case throughout India, including temples and small villages. It's a reminder of what India has become and that, likely, the manufacturing industry has replaced the tradition and culture of handmade products that you might find, even in the U.S. - With that said, almost everything can be had by brokering a deal. Department stores carry a plethora of traditional Indian clothes, which means if you fall within the traditional body size here, you really don't need to pack clothes. Considering my King Kong proportions, I skipped the attempts to sausage my way into the clothes and settled on a colorful travel bag. Aditi sends us in search of the Henna Man, a guy who does temporary flowering hand tattoos but because of the holiday (Ugadi), our manhunt was unsuccessful. Admittedly, we were disappointed and we decided to shift to a small second floor cafe overlooking the bustling Commercial street below. This is when we happened upon a drink of mysterious substances. A Jaljeera which is a combination of ginger, cumin and mint. I can eat things that most people would never even think about, but this was telling me, "don't do it", from the first sip. It's incredibly strong and I decided to pass it along to Shannon who guzzled it down. A decision, that would prove to be a smart in the hours to come. Jaljeera is seen as a detoxifier by many, and as Shannon would find out, her body must have had a few toxins. If we were in the north we might call it Delhi Belly, but here in Bangalore, I am without the proper euphemism. Eventually, we headed off to Aditi's neighborhood. A cosmopolitan area with high-end boutique shops where the quiet upscale showrooms and tree-lined streets offer sanctuary from the mid-day heat. Here, I had brief run-in with a pestering beggar who seemed strangely attached to talking only to me. 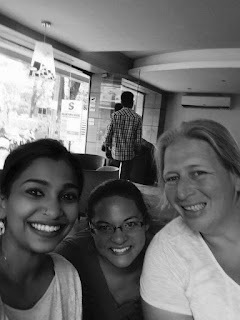 We shopped some more then ended up at Cafe Coffee Day, the Starbucks of India. As we walked in, the cafe was in the process of paying-off a gentleman who stood at the door playing a large flute that made the most annoying tone until he was bribed to leave. I was particularly fond of this chain of coffee shops, as they always appear in Bollywood movies. Selling locally sourced coffee beans, the chain began right here on Brigade Road in Bangalore back in 1996. Today, what is probably comparable to the McCoffee of India is now an international chain known for their brilliant marketing tag line, "A lot can happen over coffee". They serve up one of the most amazing chocolate ice-cream coffees you've ever had. Their jamun (java plum) cream drinks offer a fruity alternative that instantly cools you down. After hours of talking, Aditi had to get back to her work as Bangalore's top public relations professional. In a city that is always moving, work and play are always a difficult balance for the young, hard-working individuals that make this city move and shake. After saying goodbye, not know when and where I'd see Aditi again, I tried to focus on what was to come in the next few days. I needed to keep my mind focused so that I don't fall to pieces. It's difficult when your closest friends are a world away and burying that loss meant convincing myself that things weren't ending. Repeating to myself over and over that something new was right around the corner. We headed off to Cubbon Park, an exotic and wild central park in the heart of the city where pets, local residents and the most incredible trees flourish in beautiful gardens. It's easily one of the most amazing city parks I've ever been to and it is unique in that lacks the manufactured aspects of parks in North America. It's an oasis among the traffic and buildings that imprison the park and a reminder of what Bangalore may have looked like before becoming a global urban center. By now it was growing late and our biggest adventure was to come. However, I had one last stop I had to make in the city and admittedly, this will seem rather silly. You see, for the last few years I have lived and breathed India from afar. Having exhausted Europe and America, I watched television and movies, joined online groups, even learned a little Hindi here and there. For some travelers, the idea of visiting a fast-food chain seems corny or anti-authentic to the experience. However, in India, chains like McDonald's don't even sell beef and therefore have a complete menu of unexpected unique foods that you can't even get in the U.S. - I've seen the commercials, and I knew the moment I heard about a the McPaneer (a fried cheese sandwich), I had to have one. In fact, I would argue that McDonald's in India may actually make far better food here in India than they ever do in the U.S., and it's well worth a stop considering you will never, likely, see it on the menu here at home. Their flagship sandwich is a version of the Big Mac called the Majaraja Mac. It's a double chicken (or veg) sandwich with habanero mac sauce and jalapenos. You can even grab a Thumbs Up, India's spicy version of Coca Cola to go with your meal. Considering my love of spice and hot foods, I found that India's western junk food could lead to my undoing if they ever brought such products to my neighborhood. As we retired back to our room to do some laundry. Shannon began feeling a bit sick. By morning we were leaving for Coorg, but we would find no sleep as she spent the evening crawling from the shower and toilet. Many restaurants are careful in how they spice their dishes for westerners, something I dislike since I can pretty much eat lightning and crap thunder without batting an eye. "Would you like a side of lava with that M'am? ", "YES PLEASE!!!". However, Shannon had consumed something during the day that reacted with the revenge of the Gods upon her digestive track. Perhaps it was merely bad Karma, fate or balance? It was explained to us that everything is a balance here. If your shop is too gaudy, too bright, too modern or outlandish you must balance it with a red mask to balance the good with the bad. Here, you balance tradition with the modern and light with the dark. From fashion to food, balance is everything here in India. You'll find traditional fashion of kurtis paired with modern jeans, pizza topped with curry and McDonald's among traditional dosa shops. You might think that Shannon getting sick was a really bad thing, but from an Indian's perspective you might just see it as a balance being paid for something great to come. What begins must end, but what ends will begin again. Such is India.